Homemade Bamboo Shoot Soup with sponge gourd luffa for lunch in Vientiane. 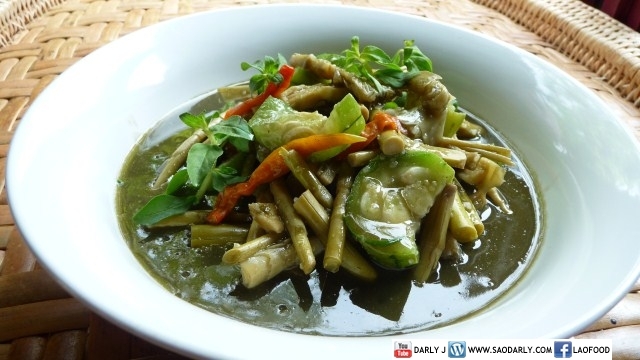 There is no meat or fish in the soup and enough sponge gourd and phak kayang (rice paddy herb) to complete the dish. Another way of making this soup is using pumpkin instead of luffa. When I think of Keng Nor Mai or bamboo shoot soup, it reminds me of the time I spent with my deceased grandmother in Vientiane, Laos. She loved to make this soup and Jeow Padek to go with it. My task was to pick herbs from her garden to go with the soup and the jeow. Sabaidee! Can you post the recipient, that’s look very good!! Please check out a recipe by Chef Pounger. Making my mouth water!!! I love kaeng nor Mai with quail eggs also. You can try this Lao Bamboo Shoot Soup recipe from SBS Food, which is in video format. Another good Bamboo Shoot recipe is from Traditional Recipes of Laos by Phia Sing (Royal Cook in the Royal Palace at Luang Prabang). I have this cookbook and recommend to you if you would like to try out more recipes. sabaidee nong sao darly! i watch your shows all the times, if you don’t mine I am asking? who’s paid for your expensives like Hotel stay? airlines tickets? and money for your daily meals for example: Breakfast, Lunch and dinner? I very Love your shows on youtube alot! i WILL CONTINUED KEEP WATCHING YOUR SHOWS UNTIL YOU STOP? Thank you very much nong sao darly for your foods show keep up the good works nong sao darly, I will be supporting yours show and passed informations about your Lao foods travel’s informations to the world. Sabaidee Ai Jay. Thank you very much for following my Youtube channel and for visiting my site. My trips to Laos have been made possible through daily savings and making personal choices. Rather than buying a Gucci handbag, the money is used for flights to Laos. I hope to visit Laos in the near future and record my travel to share with others. Take care and thank you for your kind words.